Want to earn this awesome Race bling? Don’t worry. Unlike most races, we’re not making you run a grueling half or full marathon. 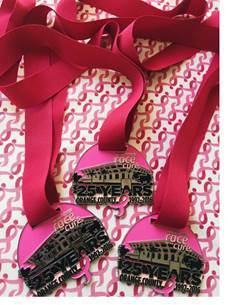 All you need to do to earn our 25th Orange County Race for the Cure Commemorative Medal is register and self-donate $25 or more at the time of registration. If you’ve already registered and did not get a chance to self-donate, email us at race@komenoc.org. Show how committed you are to ending breast cancer by wearing your Race bling! You can pick up your medal when you pick up your Race packet at our Race registration and packet pick up suite or on Race Day. Click here to find out the dates and times for our Race packet pick up.